What happens when outside agitators work with state politicians to pass the nation’s most draconian anti-immigration law yet? Alabama learned the hard way. Note: A longer version of this article, as well as a data analysis of the 164 anti-immigration laws passed by state legislatures since 2010, appeared in the March/April 2012 issue of Mother Jones. Read the whole package: Inside the Self-Deportation Movement. Saturday was game day in Alabama, a clean, bright September afternoon. The Crimson Tide and Tigers were both at home, all but emptying Birmingham out. I headed north toward Cullman County to talk with Keith Smith and other farmers about HB 56, Alabama’s divisive anti-immigration bill—the toughest in the nation, signed by Gov. Robert Bentley in June and suspended at the end of summer after several groups sued to stop it, forcing US District Judge Sharon Blackburn to consider its constitutionality. Her ruling, which came down this morning, allows much of the law’s most draconian provisions to stand. (Read more below.) But even before the ruling, Alabama had suffered a long summer of bitter confrontations over race and regulation, and in many ways, the damage has been done. The vista along I-65 still showed scars from the massive tornadoes that ripped through the state back in the spring, just a week before HB 56 passed—in buzz-cut swaths and pools of pine and scrub oak smashed and smeared together on a bluff. Among the towering lampposts that light this highway at night, a couple had been snapped in half. One even made for fascinating disaster art, bent and twisted like a Calder public sculpture. Farther north, heading into Golden Ridge, the road was flanked by more fallout: piles of rock and rubble flanking lucky homes somehow spared, and blue tarps flapping on the roofs of others, less lucky but still standing. I pulled into Keith Smith Farms, a compound of chicken houses and warehouses at the far end of a long gravel drive and fields bending over the horizon. Smith pulled up in a white pickup with a couple of collies, each with a lame back leg but hobbling at an impressive clip. Smith is an enormous man whose size befits the truck he drives. He moved slowly and with effort, suppressing a pain that seemed to rise up from swollen, darkened ankles. 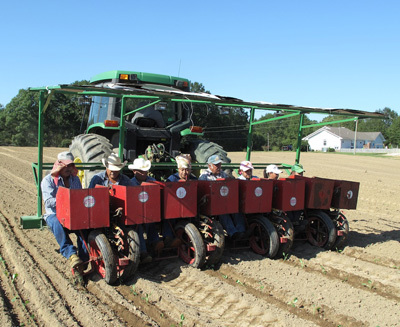 Smith grows sweet potatoes and greens in addition to raising pullets for Tyson, Ingham, and other poultry giants. 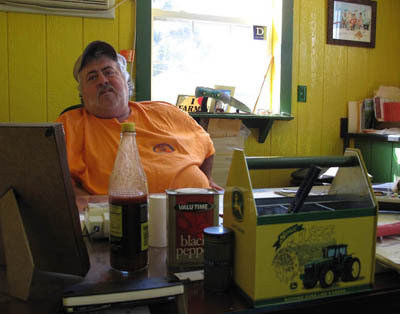 Farmer Keith Smith says HB 56 will put him out of business.The previous Monday, he and other farmers had met with lawmakers, including state Sen. Paul Bussman, at a restaurant in nearby Good Hope to air their grievances over HB 56, making clear their farms were at risk. Bussman, a Republican, had himself publicly expressed concern over aspects of the bill, but he voted for it nonetheless. As for Smith, he’d expected little relief from the meeting—he’d already lost eight workers due to fears about the law’s impending passage—and wasn’t too optimistic about his future as a farmer, either. The problem, of course, is that anyone here legally refuses to do the kind of backbreaking work Smith has to offer. It stands to reason that anyone with good papers—even well-faked papers—would make the most of them. Agriculture is a grueling, billion-dollar industry in Alabama. 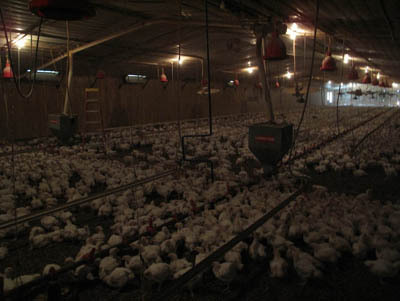 A third of that business is poultry, the rest driven by small farms like Smith’s. Wages range from the $7.25-an-hour state minimum wage to about $14 an hour (other jobs are paid as “piecework”—30 cents a bucket of potatoes, say, or a couple bucks per thousand chickens for chicken catchers). And while anti-immigration arguments hang on the idea that if illegal workers were barred from these jobs Americans would be enticed onto these fields and into these chicken houses, Smith and other farmers don’t give it a second thought. Most of the non-Latinos that Smith has hired over the years last maybe a couple of hours at most, he says, before they quit. Though it comes off as exaggeration, the scenarios Smith mentioned do fall within the purview of HB 56. The law is alarmingly tough, eclipsing Arizona’s SB 1070 by several measures—including, among other punishments, incarceration and fines for anyone who knowingly employs, harbors, or transports illegal immigrants. Giving an undocumented immigrant a ride to work, offering them shelter, offering them sacrament: All of these acts are, with just the slightest interpretation, criminalized in the bill. Chicken houses on Smith’s farmThe language is that sweeping and vague. One of the more incendiary measures of the law requires the Department of Education to “accurately measure and assess the population of students who are aliens not lawfully present in the United States”—a provision that flirts with undermining the Supreme Court’s 1982 ruling in Plyler v. Doe, which guarantees an education to undocumented immigrant children. State Sen. Scott Beason insisted that the measure was simply a matter of accounting: “That is where one of our largest costs come from,” he told the Montgomery Advertiser. “It’s part of the cost factor. Are the parents here illegally, and if they were not here at all would there be a cost?” But it doesn’t require too much extrapolation to figure out that by this simple head count, teachers could become unwitting, harboring accomplices if they fail to turn a family in. Workers at Smith’s farmHB 56 was authored by state Rep. Micky Hammon, for whom immigration has long been a platform issue, and was guided to the governor’s desk by Sen. Beason (recently caught on a wiretap referring to blacks as “aborigines”). That HB 56 shares provisions with similar laws in Arizona and Georgia is no coincidence: All three are part of a larger anti-immigration effort orchestrated by the Federation for American Immigration Reform and its legal arm, the Immigration Reform Law Institute. (While Hammon is the official author of HB 56, its architect is Kansas Secretary of State Kris Kobach, who is also of counsel to IRLI and has crafted Arizona’s SB 1070 and scores of anti-immigration laws and ordinances across the country). Both Hammon and Beason promoted the bill with the kind of hyperbole that whips a crowd up, calling out to the counties “most heavily hit by illegal immigration,” as if the arrival of the Latino workforce were a natural disaster. To give HB 56 some push, Hammon adopted some alarmist data, claiming that Alabama has “the second fastest growing population of illegal immigrants in the United States,” even though only 120,000 of the estimated 11 million undocumented immigrants in the US live in Alabama, according to the Pew Hispanic Center. In June, he told the Anniston Star that illegal immigrants cost Alabama between $600 and $800 million annually, an estimate that combined the fiscal impacts of unemployment, health care, education, and lost tax revenue. When the Star fact-checked his figures, it discovered that he’d simply extrapolated from a study done on Arizona by the Federation for American Immigration Reform. FAIR had included Alabama in the study, but with a burden of $298 million. Tuscaloosa police discovered people nursing their own injuries, including broken bones, for fear of seeking help at hospitals and being deported. If anything, opponents say, the bill promises to place an even greater fiscal burden on the agencies charged with enforcing it. Just this week, Jefferson County Sheriff Mike Hale warned that he may have to lay off more than 100 of his deputies and close several substations in order to meet the $6.5 million in budget cuts proposed by the county commission. In the last two years alone, the sheriff’s budget has been chopped by $18 million. Considering such fiscal emergencies, Hale and other law enforcement officials insist, the enforcement of a federal immigration law is a rather low priority, especially since it treads questionable grounds of jurisdiction and legal authority. In Tuscaloosa County, even before the bill was signed by Gov. Bentley, Sheriff Ted Sexton questioned its practicality, saying that while he supported the concept of HB 56, he had serious concerns about whether local law enforcement could afford to train deputies to double as immigration officers. (The bill includes no funding for the six weeks of training required.) Then there are the more impractical realties, such as incompatible fingerprinting systems on the local and federal levels and a county jail with a capacity for 540 inmates that is already packed with some 600. 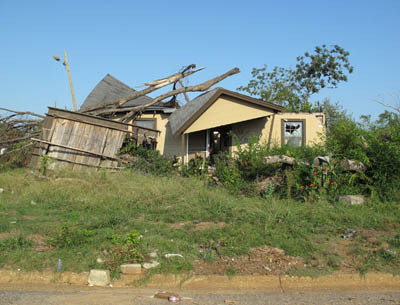 Tornado destruction in Cullman County, AlabamaTuscaloosa was one of the towns hardest hit by April’s tornadoes, which flattened most of the cottages along University Avenue and in areas like Alberta and Hope, both largely Latino. In the days following the storm, Tuscaloosa Police Chief Steve Anderson realized that very few Latinos had shown up at various aid stations that had been set up around town, despite the damage done to the neighborhoods where they lived. “We realized they were largely unaccounted for,” Anderson said. He and Sexton sent officers and deputies into Alberta and Hope, and discovered people nursing their own injuries, including broken bones, for fear of seeking help at hospitals and being deported. 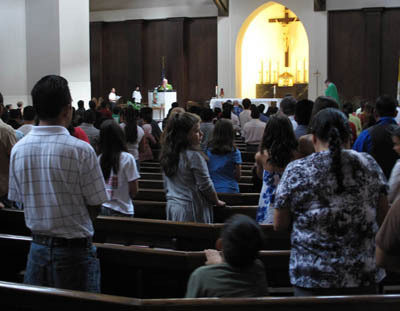 Rather than respond to FEMA’s outreach, many sought shelter at Holy Spirit Catholic Church, a charity HB 56 will potentially criminalize. Letting her boys go will be a painful process, she said. These were more than laborers to the Bagwells—she didn’t refer to them as “her boys” for nothing. A genuine friendship would be shredded. Mind you, there was still a line of sorts—cultural, color—but it was subtle. Her anxiety over doing them any harm was real, as real as the smoke seeping from her lips as she puffed constantly, a habit she’d picked up over the summer. When was that retirement supposed to have been? “Well, it ain’t no time soon,” Keith said, and they laughed. She didn’t say when those and other parts of the law could take effect, but her previous order blocking enforcement expires on Thursday. Neither Gov. Robert Bentley nor Alabama Attorney General Luther Strange had any immediate comment on when the state would begin enforcing parts of the law. • Make it a crime for an illegal immigrant to solicit work. • Make it a crime to transport or harbor an illegal immigrant. • Allow discrimination lawsuits against companies that dismiss legal workers while hiring illegal immigrants. • Forbid businesses from taking tax deductions for wages paid to workers who are in the country illegally. Mother Jones will be following this story. Check back for more updates. This story was reported with help from the Investigative Fund of the Nation Institute.